All One Thr﻿ead﻿﻿﻿ is a not-for-profit global network, focused on bringing together hand embroiderers from from all over the world, on safeguarding traditional  designs and stitching techniques and on expanding  access to market and business opportunities. 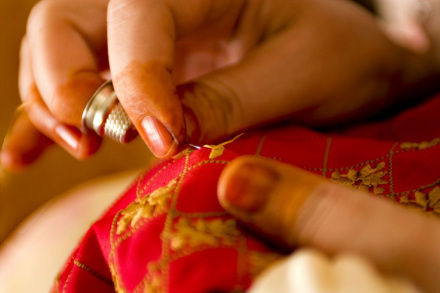 Embroidery is thousands of years old and is still practiced by women and men all over the world. Yet – unlike many other crafts – there has been no global network to promote this skill and to ensure that traditional patterns and stitching techniques are documented. In fact, in countries affected by war and natural disaster, hand embroidery is being lost. Not only the craft itself has taken a downward turn in countries like Haiti and Serbia, but traditional patterns and stitching techniques are also disappearing without having been documented in any way. ﻿All One ﻿Thread﻿ (AOT﻿)﻿﻿﻿ ﻿aims to fill this gap. It was born from the love that Lynn Sim and Paula Claycomb have for embroidery. Collectively, they have over 30 years overseas experience working in International Development and can assure you that hand embroidery is alive and well in all corners of the globe. Have a look at our objectives to discover how you or your organization can beneﬁt by joining the AOT network. Print our brochure for others to see. Together we can make a positive impact in the lives of women and their families!